Sometimes you just get tired of the way you look. It’s not necessarily that you don’t like what you see when you look in the mirror. Instead, it’s just that you just feel like it’s time for something new. If you want to make a big, dramatic change in the way you look, you have a couple of options. You could start a diet and exercise program and lose a bunch of weight in six to eight weeks. Or you could go on a shopping spree and get a whole new wardrobe — at a cost of a couple of thousand dollars. But if you want to make a major change in the way you look right now without emptying your bank account, the solution is treating yourself to a Brazilian keratin hair straightening treatment by Maria Teixeira at your local professional hair salon. A Brazilian keratin hair straightening treatment will give you the kind of long, straight, and luxurious hair that dramatically changes the way you look instantly. You will walk out of your hair salon looking like a whole new person. And it only takes about 90 minutes from start to finish. Plus, your Brazilian keratin treatment will last at least a few weeks and possibly as long as two months if you treat your hair right. That means you can sustain your whole new look for weeks to come without spending another dime on the way you look. Your Brazilian keratin hair straightening treatment will give you the kind of fast, dramatic change in the way you look. And you can keep looking your best for weeks or even months to come. So what are you waiting for? 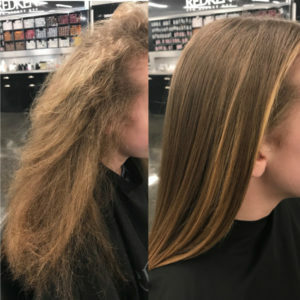 If it’s time for a change, it’s time for a Brazilian keratin hair straightening treatment from Maria Teixeira at your local professional hair salon.